The Wisconsin Articles of Incorporation – Nonstock Corporation is a template form which covers the basic requirements a nonprofit corporation, seeking to operate as such, must submit to the Wisconsin Department of Financial Institutions. This form will name the information required in each article and represents the minimum amount of information that must be reported for a successful review. It is worth bearing in mind that some corporate entities, depending on their type, may be required to report additional information and it will be left up to the Incorporator of that entity to make sure such information is present and supported within the Wisconsin Articles of Incorporation – Nonstock Corporation. If necessary, Incorporators may submit articles they have drawn up themselves however such documents must include all the information called for in these articles. You may submit the Wisconsin Articles of Incorporation – Nonstock Corporation to the Wisconsin Department of Financial Institutions by Mail, Express Mail, or online. This will require payment of the $35.00 Filing Fee. This fee is payable by credit card, if you are filing online. If you are filing by mail, it must be paid for with a check made out to “Department of Financial Institutes.” You may mail the articles to State of WI – Dept. of Financial Institutions, Box 93348, Milwaukee WI 53293-0348. If using Express or Priority Mail, send the articles to Department of Financial Institutions, Division of Corporate & Consumer Services, 201 W. Washington Ave – Suite 300, Madison, WI 53703. 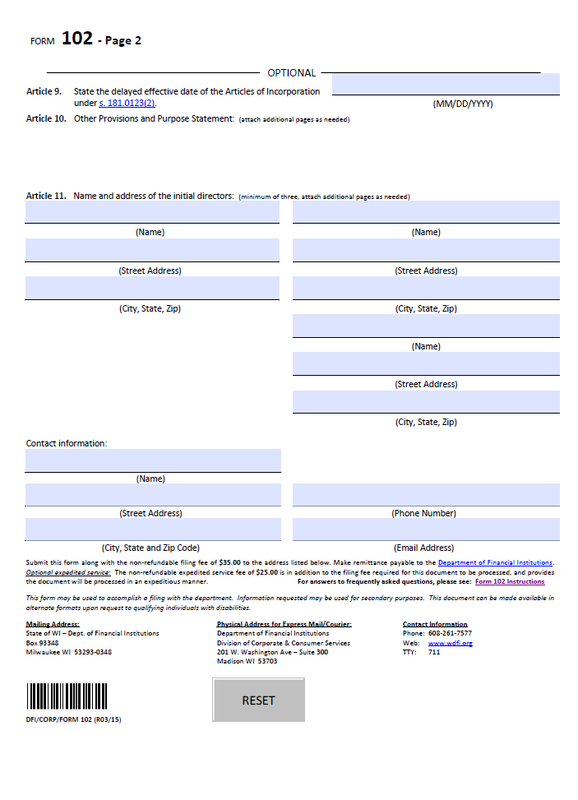 Step 1 - Select the link labeled “Download Form” above or click here: Form DFI Corp 102 then save the PDF file to your computer. You may use an appropriate program designed to enter information on PDF forms or you may print the form and enter it manually. Make sure to use black ink. Step 2 - In Article 1, you must report the full Name of the corporation being formed by these articles. Make sure to include a word of incorporation. Step 3 - In Article 2, report the Complete Mailing Address of the initial Principal Office. The first line is provided for the Building Number, Street, Unit Number/PO Number. Then use the second line to enter the City, State, and Zip Code. Step 4 - Article 3 will require the Full Address of the Physical Location of the initial Registered Office to be documented. The line labeled “Street Address” should be used for the Building Number, Street, and any applicable Unit Number of this location while the second line is reserved for the City, State, and Zip Code to be reported. Step 5 - Next, in Article 4, report the Full Name of the Wisconsin Registered Agent who will represent this corporation when Service of Process must be served. Step 6 - If this corporation will have members, then mark the first check box in Article 5. If not, then mark the second check box in Article 5. Step 7 - The Full Name of the individual who has drafted or entered the information on this document must be reported in Article 7. Step 8 - As per Article 8, you must report each Incorporator’s Full Name and Complete Address. 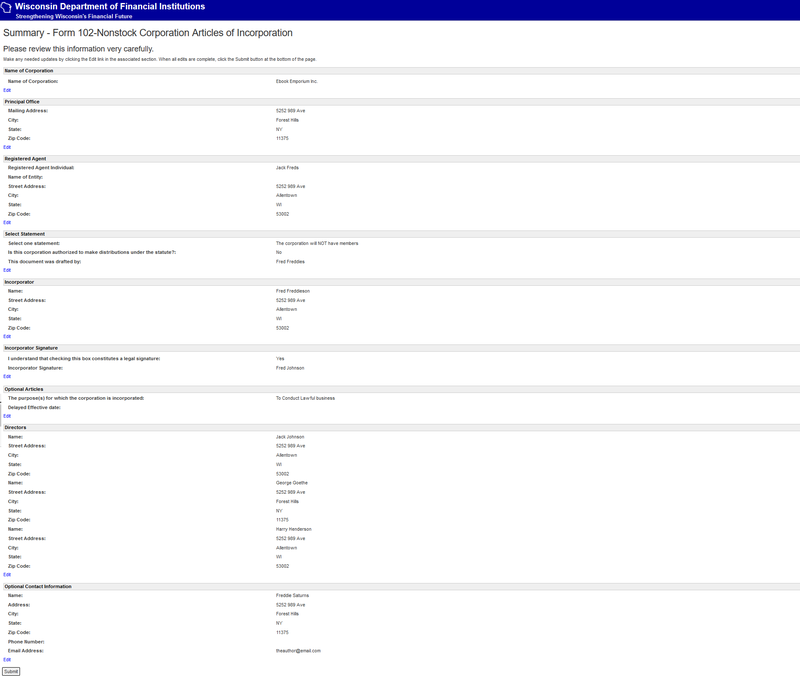 This must be a complete roster and additional pages may be attached if there is not enough room on this document. Make sure to clearly label the attachment bearing the remaining Incorporators’ Names and Addresses. 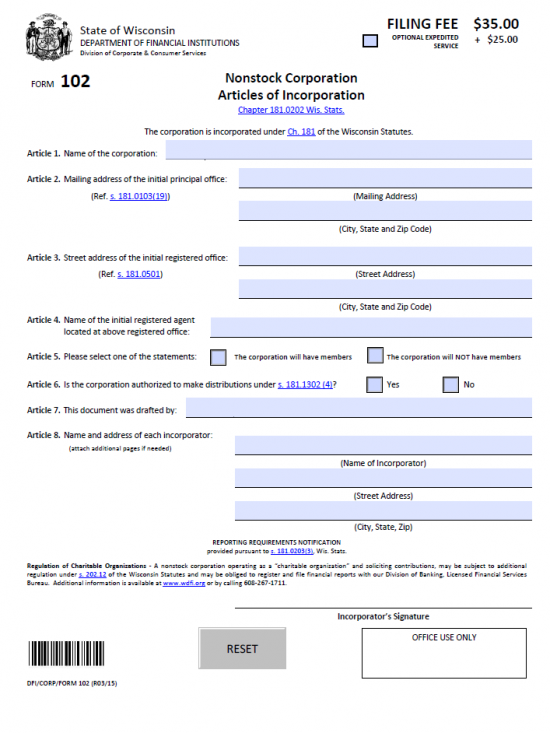 Step 10 - The second page of the Wisconsin Articles of Incorporation – Nonstock Corporation will give the opportunity for several additional pieces to be entered, if desired by the Incorporator. In Article 9, you may name a Delayed Effective Date for these articles should the entity being incorporated desire more time before assuming corporate status. This may be any date between the Filing Date and 90 days past the Filing Date. If left blank, the Filing Date will be the Date of Effect. Step 11 - Next, you have the option of listing all the initial Directors serving the forming nonprofit corporation. If you report this, you must report the Full Name and Complete Address of each Director. Step 12 - While you are not obligated to report a Contact Person’s information, this may be a time saver in the event that any problems with the Wisconsin Articles of Incorporation – Nonstock Corporation being submitted. If reporting a Contact Person, enter the Full Name in the box labeled Name. Then use the boxes labeled “Street Address” and “City, State, and Zip Code” to report the Complete Address. Finally, report the Daytime Phone Number and the Email of the Contact Person in the appropriate boxes. Step 1 - Open https://www.wdfi.org/apps/corpformation to go to the Wisconsin Online Articles of Incorporation page, maintained by the Wisconsin Department of Financial Institutions. Step 2 - Locate the link at the bottom of the page labeled “Nonstock not-for-profit Corporation – Wisconsin” then click on it. This will direct the browser to the proper page to begin. Step 3 - This page will have several sections with information. Read each one carefully. When you are ready, select the “Start” button at the bottom of the page. Step 5 - Next, you will need to enter the Mailing Address of the nonstock corporation being formed. There are four fields available to this end: Mailing Address, City, State, and Zip Code. Fill in the Complete up to date Corporate Mailing Address for this entity. Step 7 - On this page, use the first drop down list to report if this nonstock corporation will have Members or not. 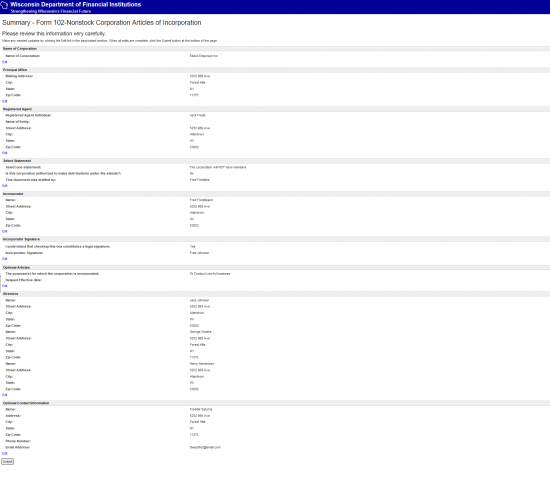 If so, select “This corporation will have members.” If not, select “This corporation will NOT have members.” In the next drop down list, select “Yes” if this nonstock corporation is legally allowed to make distributions. If not, select “No.” In the third field on this page, the individual filling out this form must enter his/her Complete Name. Step 11 - Report the Purpose of the nonstock corporation in the text box labeled “The purpose(s) for which the corporation is incorporated.” There will be an option below the Purpose section to indicate if a Delayed Effective Date is desired. If so, then report the Date of Effect (between the Filing Date and 90 Days past the Filing Date.” If you leave this field blank the Date of Effect will be the same as the Filing Date. Step 13 - In the “Name” field, enter the Full Name of the initial Director being reported. If you wish to auto populate the Address fields, you may select the “Use” button next to the appropriate Address in the “Copy address from” section. If a different address must be reported then you may use the “Street Address,” “City,” “State,” and “Zip Code” fields to report the information requested. When you are done, you may select “Add Director.” If you have another Director to report select “Add Director” (there must be three reported) or, if all the parties have been reported select “Next” to proceed to the next page. Step 14 - The next page will request that information for a Contact Person be reported. In the first field, “Name,” report the Full Name of the individual who will serve as the first point of contact to this nonstock corporation for the Wisconsin Department of Financial Institutions. You may auto populate the fields with a previously entered Address by going to the “Copy address from” section and selecting the button labeled “Use” for the corresponding Address. You also have the option of manually filling in the Contact Information utilizing the fields labeled “Address,” “City,” “State,” “Phone Number,” and “Email Address.” When this has been entered select the button labeled “Next.” Note: Enter a Daytime Phone Number in the “Phone Number” field and make sure to use an up to date “Email Address” as it will be used to send notices regarding annual reports. Step 15 - You now have an opportunity to review all the information you have entered. Each section will be displayed and contain a link labeled “Edit” to navigate back to that section. Once you have verified that all information is correct, select the button at the bottom of the page labeled “Submit.” This will direct you to an area where you may input your credit card information to pay for the $25.00 Filing Fees and any other applicable Fee.